I didn’t much enjoy the audiobook of The Invisible Man by H. G. Wells (and it was the book’s fault, not the narrator) but I still decided to go on to a re-watch of the movie starring Claude Rains—mostly in the hope of finding a better version of the story! And it gives me an entry for R. I. P.’s Peril on Screen. I’m happy to report I much preferred the movie to the book—and would absolutely recommend watching the movie instead of reading the novel, and that is not a recommendation I often make! The funny thing is, it was a mostly accurate interpretation, which nevertheless made a bad book into a good movie. You see, what’s long and dull in a six-hour audiobook occupies a 70-minute movie very nicely! The plot is more or less the same—a strangely bandaged man arrives at an inn, engages in scientific experiments, and is eventually revealed to be invisible…and then he proceeds to go on a rampage. That’s almost enough plot for 70 minutes, and the movie threw in a bit more backstory and a bit of romance to fill it out. This invisible man was working with two other scientists, Dr. Cranley and Dr. Kemp, and was in love with Dr. Cranley’s daughter. Just that little hint of background and connections makes him more sympathetic, and more fleshed out (no pun intended!) as a character than anything in Wells’ book. 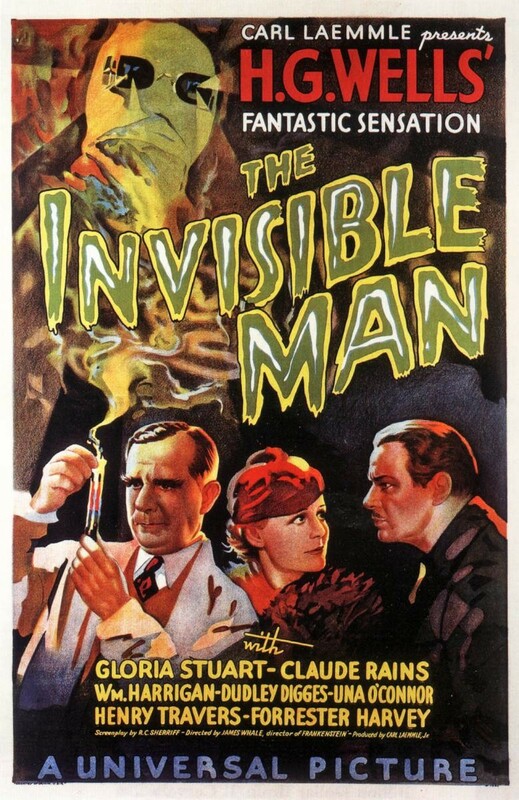 Cranley also deduces that the invisible man went insane as part of the invisibility—Wells’ character seems to have been a psychopath entirely apart from his scientific experiments. Speaking of not being fleshed out, the special effects of the invisibility are very impressive, especially for 1933. The scene of the bandage unwinding from an invisible face is a classic of film and still convincing–with no CGI involved! Back to the characters, Cranley and Kemp between them split the part of Kemp in the book. Movie-Kemp gets most of book-Kemp’s plot, but Cranley gets book-Kemp’s intelligence and courage. Movie-Kemp is rather a sad and panic-stricken coward most of the time. Cranley, on the other hand, can’t avoid being likable. As soon as he came on screen I was sure I recognized the actor, and sure that I had seen him playing someone very nice because I was getting a distinctly warm and fuzzy feeling in the recognition. Turns out he was played by Henry Travers, probably best known as Clarence in It’s a Wonderful Life, and you can’t get much warmer and fuzzier than that. I’ve loved Claude Rains ever since seeing him in Casablanca, and he was excellent here. There is, obviously, no opportunity to portray anything by facial expression, so it’s all voice and body language. Emotions (and insanity) still come through very clearly—and Rains is more recognizable than I expected. I might be deluding myself since I knew it was him, but I swear I could recognize him in the opening scene as he stomps bandaged and muffled through a snowstorm. It’s the build or the body language or something. I am sure that no one recognized him when the movie first came out—it was only his second film! I think Claude Rains was really one of the Great Actors. In a way he’s a frustrating one, though—for most of the Greats, you can point to a long list of wonderful movies. Rains, on the other hand, mostly played supporting parts and villains, sometimes decidedly odd ones. I’m convinced he was wonderful because of a lot of small parts. One of my favorites? One episode of Hitchcock Presents, where he plays a ventriloquist. I know he was capable of a wonderful subtlety and nuance and pathos…but I’m still on the hunt for more movies that will show it! And while it was fun, I don’t think I’d claim that The Invisible Man is a Great movie, or an example of Rains at his best. But it’s a good movie, and if you like to know something about classics of literature, don’t read The Invisible Man—watch the movie instead. I loved him in “Casablanca,” and in “Notorious,” too. He was something of a sympathetic villain in that one. You knew he was going to lose the girl (Ingrid Bergman) to Cary Grant, but he was fun to watch, of course. And he was the perfect partner to Bogey in “Casablanca.” Their scenes together were wonderful. Interestingly, I was just reading about “The Invisible Man” — I haven’t read the actual book itself, and your comments make me think that is how it should stay — in “Is Heathcliff a Murderer? Great Puzzles in Nineteenth Century Fiction” by John Sutherland. In one of his “puzzles,” Sutherland asks “Why is Griffin cold?” — that is, why can’t he use the same “scientific” principle he uses to make himself invisible to make invisible clothing, shelter, and even food so that he doesn’t have to wander about naked and hungry? It’s a good question, and Sutherland always has thought-provoking answers (even if one doesn’t agree with them). I agree with you about Claude Rains. He was definitely one of the greats of the 30’s and 40’s.